Goodreads says, "Accomplished neurosurgeon Beatrice Trovato knows that her deep empathy for her patients is starting to impede her work. So when her beloved brother passes away, she welcomes the unexpected trip to the Tuscan city of Siena to resolve his estate, even as she wrestles with grief. But as she delves deeper into her brother’s affairs, she discovers intrigue she never imagined—a 700-year-old conspiracy to decimate the city. After uncovering the journal and paintings of Gabriele Accorsi, the fourteenth-century artist at the heart of the plot, Beatrice finds a startling image of her own face and is suddenly transported to the year 1347. She awakens in a Siena unfamiliar to her, one that will soon be hit by the Plague. Yet when Beatrice meets Accorsi, something unexpected happens: she falls in love—not only with Gabriele, but also with the beauty and cadence of medieval life. As the Plague and the ruthless hands behind its trajectory threaten not only her survival but also Siena’s very existence, Beatrice must decide in which century she belongs. 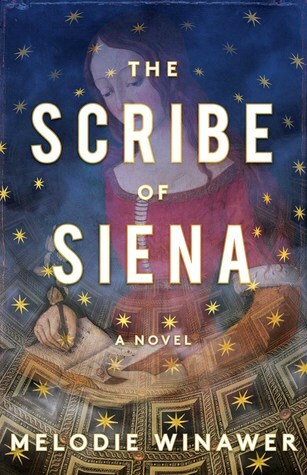 The Scribe of Siena is the captivating story of a brilliant woman’s passionate affair with a time and a place that captures her in an impossibly romantic and dangerous trap—testing the strength of fate and the bonds of love." Beatrice is a dedicated neurosurgeon who hasn't had a vacation in years. Her brother, Ben, is studying the history of the plague in Siena, Italy. He has encouraged her to come visit, but before she gets the opportunity, he suddenly dies. Now she is headed off to Siena to go through his stuff and get his things in order. Surprisingly, she is intrigued by some of his theories surrounding the plague. While continuing his research, she somehow time travels back to Siena during the 1300s. She assimilates surpassingly well into medevial of life and even finds a job as a scribe where she copies manuscripts. While there, she meets Gabriele and sparks fly. This poses a problem as to which time period Beatrice truly belongs. Plus, there's the looming cloud hanging over them that is the plague, which can't be stopped. 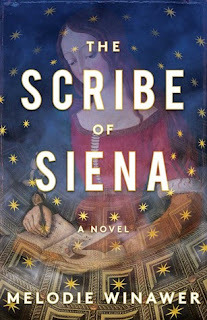 Melodie Winawer's debut, The Scribe of Siena, is an fanciful jaunt into medieval Siena. Fans of time travel novels as well as historical fiction will appreciate this book the most. Beatrice is an interesting character and one whom I immediately liked in The Scribe of Siena. She is highly educated and has many interests, which I appreciated. I loved how she jumped right into her brother's research surrounding the Black Plague. Some of the theories he proposes are pretty thought provoking as well. When Beatrice sees her own face in one of Gabriele's paintings, that's when the real mystery starts brewing in The Scribe of Siena. Although I didn't feel their blossoming romance quite as strongly as I would have liked, I still enjoyed the whole concept of their meeting. Beatrice time travels to Siena right before the plague strikes, so that is always a cause for concern when reading The Scribe of Siena. Even though Beatrice knows all about it, there's really no way to stop it. What she is confused by is the fact that Siena suffered so much more from the plague than the other important Italian cities of the time. But why? And this is the overarching question her brother was researching and he had some possible theories. The best parts of The Scribe of Siena are Winawer's descriptions of Medieval Siena. 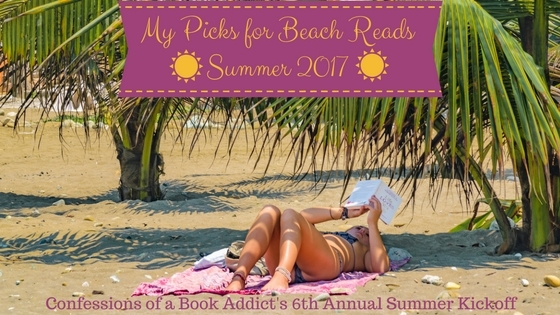 They were some of the best that I've read in historical fiction. She truly brought the time period to life. It felt real and her descriptions were extremely vivid. I could tell that Winawer did an extensive job researching it all. My only gripe with The Scribe of Siena is the fact that it took me quite sometime to get into it. I think I was expecting more of an initial pull since time travel/time slip novels are my thing. Also, some critics are comparing this debut to Outlander and although it has a few similarities, it is a different type of novel in every sense. So, fans of Outlander should be forewarned. Nonetheless, if you love historical fiction and enjoy smart reads, I urge you to give The Scribe of Siena try this summer.